The Gattamelata equestrian commission and the reliefs and figures for the high altar kept Donatello in Padua for ten years. Another important Paduan work was a bronze Crucifix intended for the altar in the centre of the choir of the Basilica of Saint Anthony of Padua. A surviving contemporary document tells us that it was being finished and polished in 1445, though it was not completed until 1449, when it was placed in the middle of the church. It was not therefore conceived as part of the group called the Altare del Santo, which Donatello executed in c. 1447-50. Many crucifixes have been attributed to Donatello over the centuries and many of these claims have been disproved. The extant document proving authorship of the Crucifix in Padua confirms how important this bronze sculpture is. 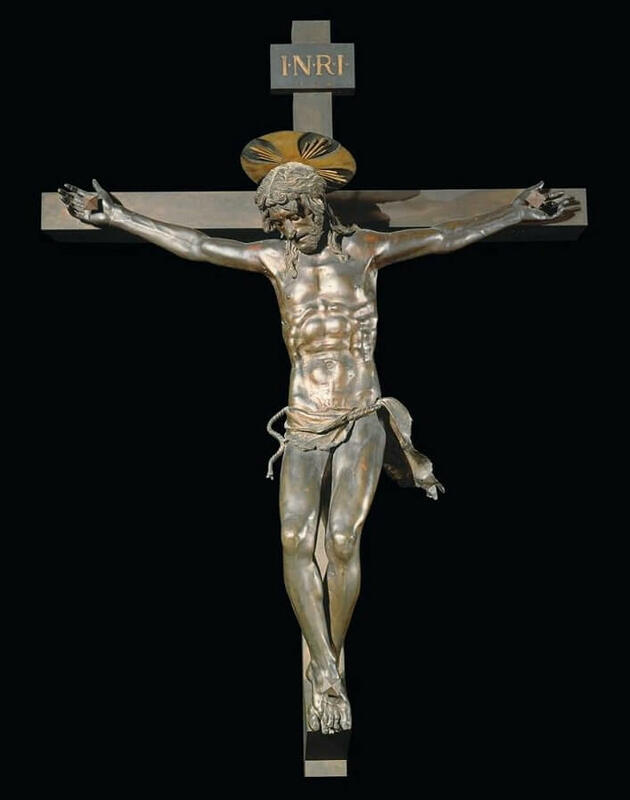 The Crucifix is an exquisitely produced piece of sculpture, particularly when considering that, save for the Saint Louis of Toulouse statue, this was the first bronze work of a comparable size that Donatello had produced. The abdominal muscles of Christ are portrayed with breathtaking naturalism, allowing light to subtly define the figure. The intricate depiction of veins in the crucified arms and feet are incredibly life-like, belying the notoriously difficult process of structuring the bronze. It was most likely the opportunity to work with the precious metal that made Donatello decide to relocate his studio to the northern city in the first place. Unlike his earlier works, which involved working on large pieces of marble, Donatello's art was now taking a different direction. He clearly preferred the modelling techniques of bronze compared to the physical and timely demands of huge blocks of marble. The majority of his late works would include a wide range of lavish bronze sculptures.